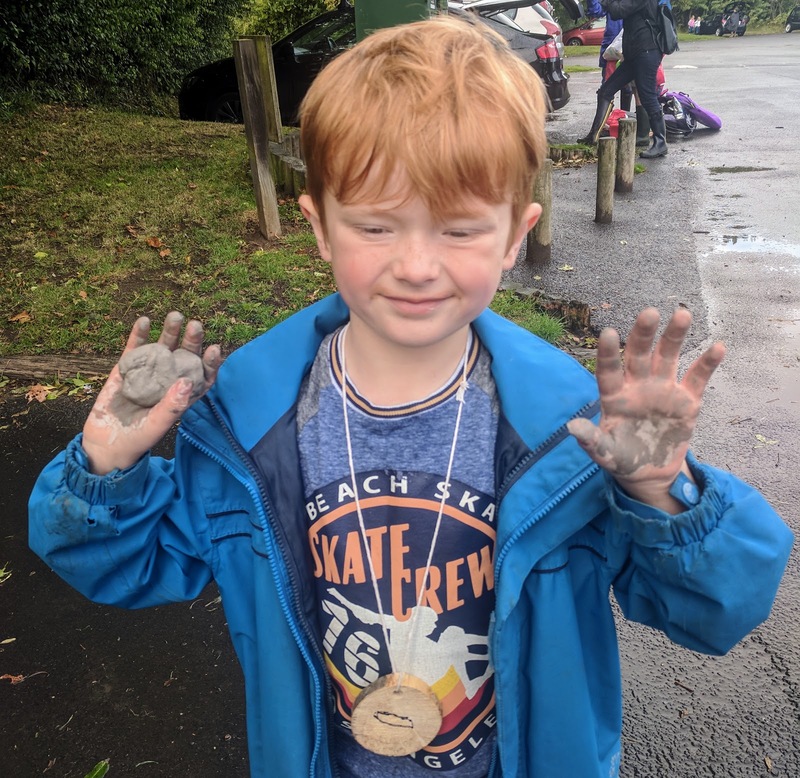 Despite what the media tries to tell us, my children (like most) still love playing outside, exploring the great outdoors and getting nice and dirty. We enjoyed lots of outdoor fun over summer and this does not look like it's going to slow down any time soon. 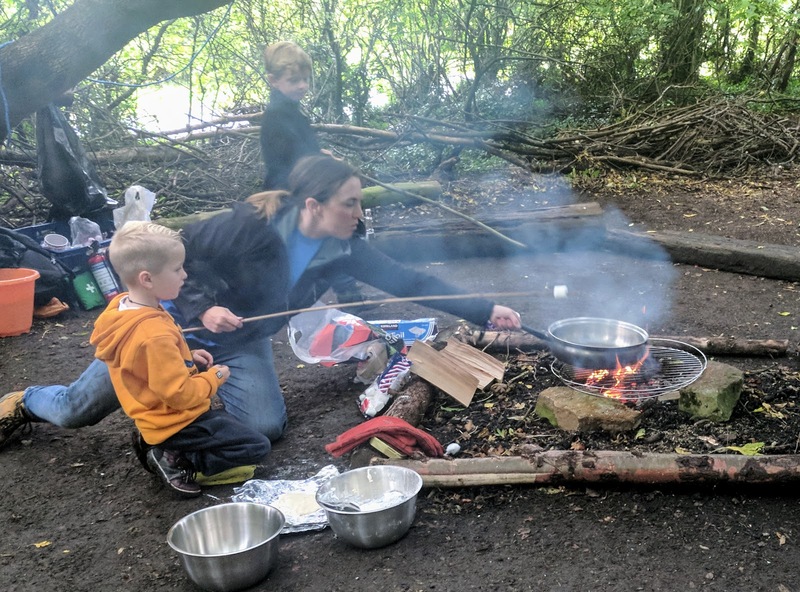 The weather is no deterrent for us and as long as you have the correct clothing, we believe that the great outdoors can be enjoyed in all weathers. 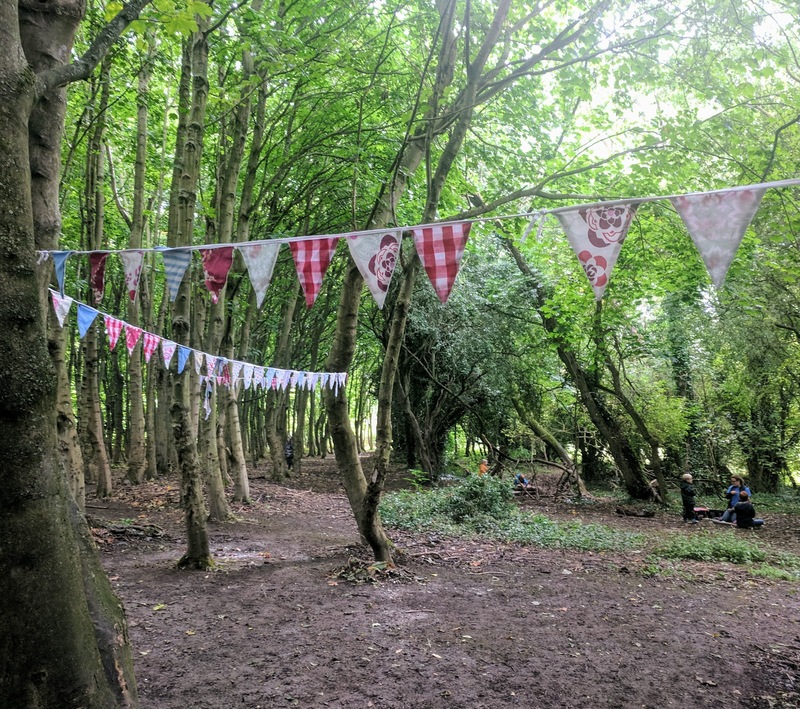 So when we were invited along to a secret forest school in the middle of Plessey Woods last weekend, I knew it was going to be right up our street. 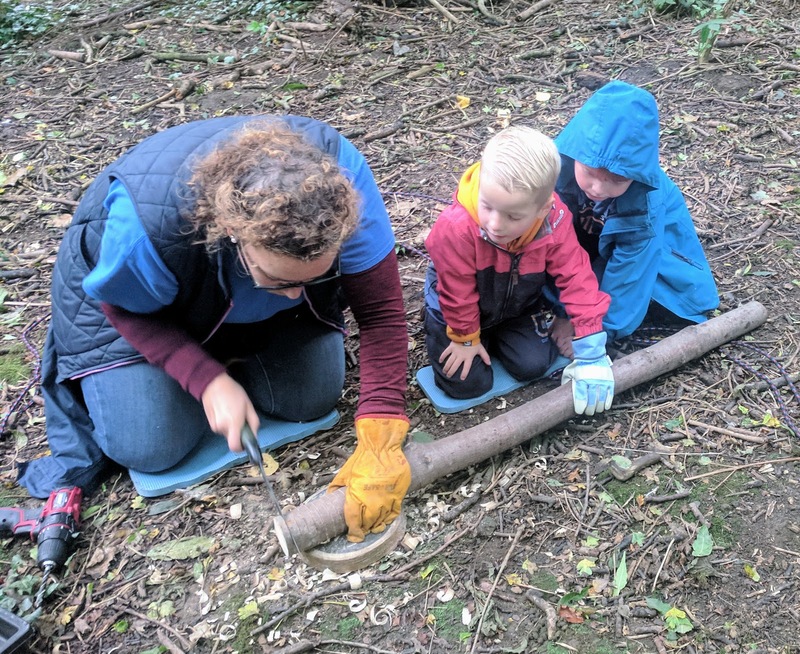 Forest school is suitable for all ages and abilities and the activities are tailor-made to the group. 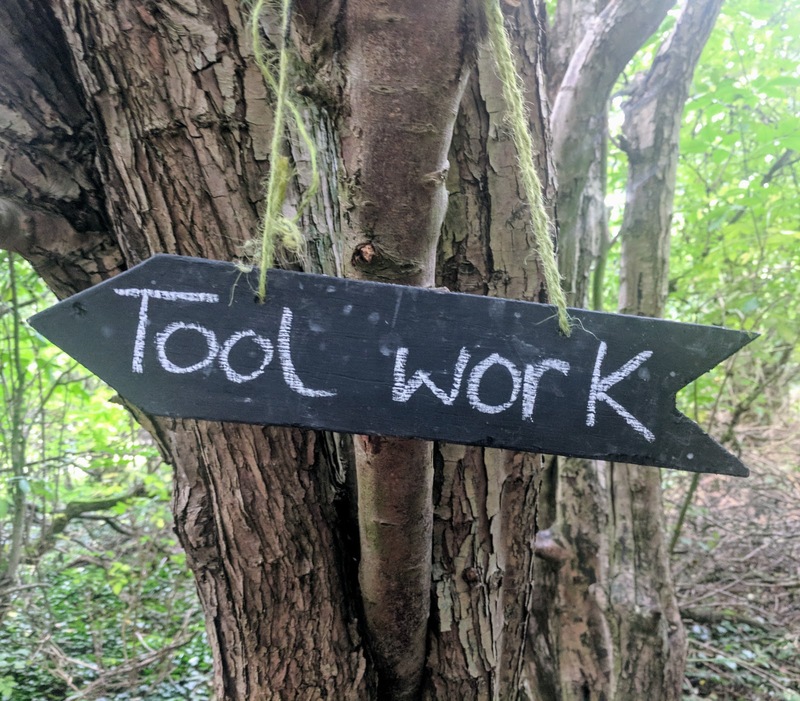 If there are lots of young children I imagine the mud kitchen will be in full swing and older groups will be keen to challenge themselves and build their own den or use real tools. 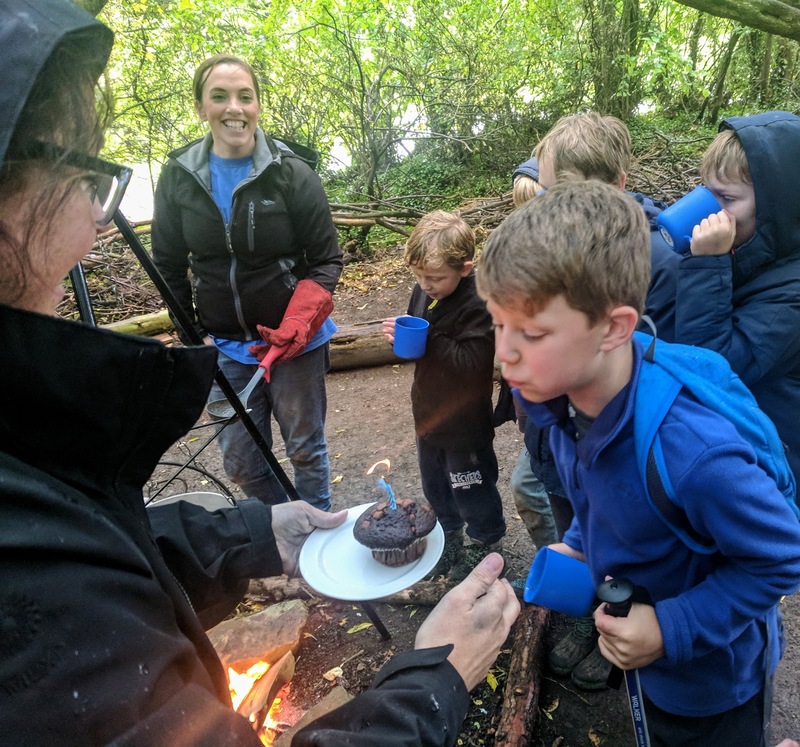 Forest School can be booked as a private event or party (fab for birthdays) and an exclusive 2 hour session can be booked from just £160 including campfire and treat (see here for full pricing and availability). 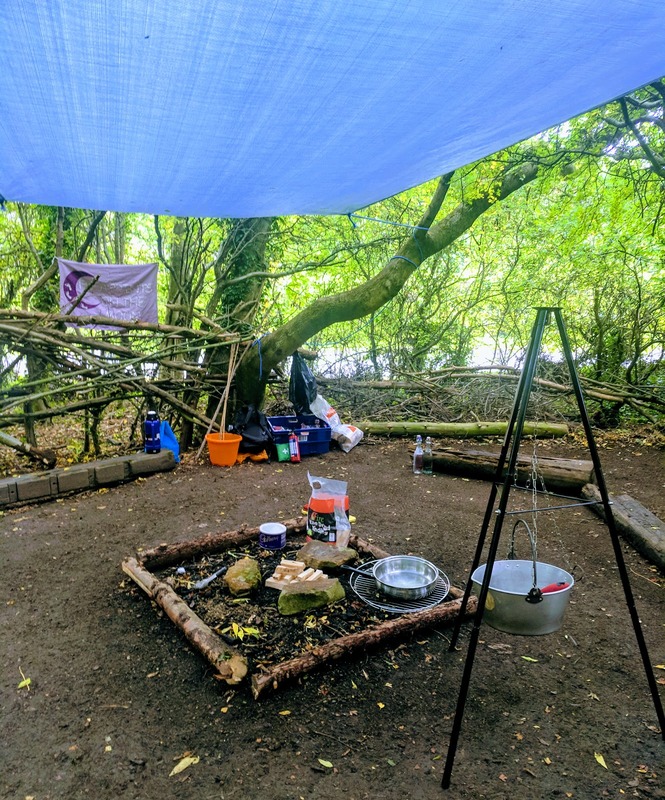 We took part in a session during heavy rain and due to the natural woodland canopy plus a few strategically placed covers, the rain didn't bother us at all and we didn't end up too wet (not that the kids would have been bothered if they were). 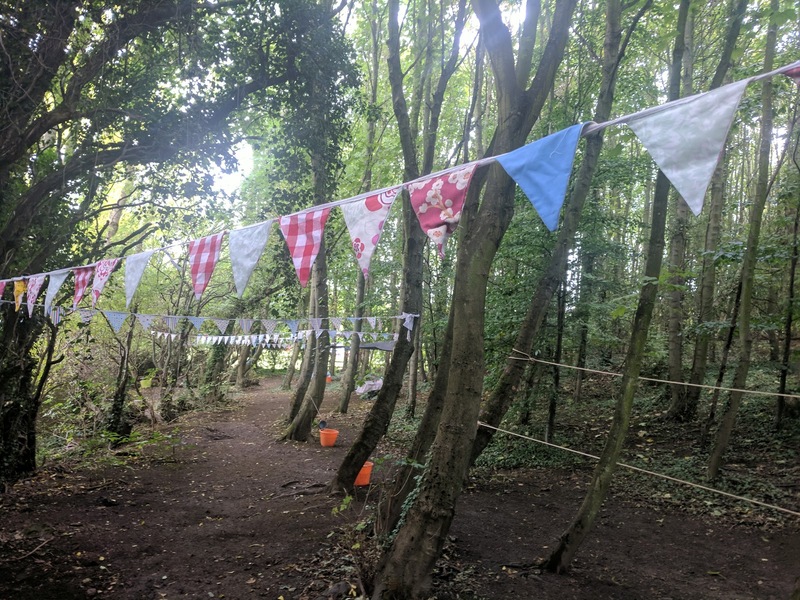 Forest School is held in a super secret location in the heart of Plessey Woods. There's plenty of free parking, a play ground, loos and cafe nearby. You'll be asked to meet at the visitor centre where Sarah, Annie and Rachel will meet you at your allotted time. After a quick safety briefing and a few games to help us get to know each other, we ventured into the woods. The setting is gorgeous and so inviting to kids and grown-ups alike. There's quite a bit of land to explore with various staffed and un-staffed stations and activities dotted about. 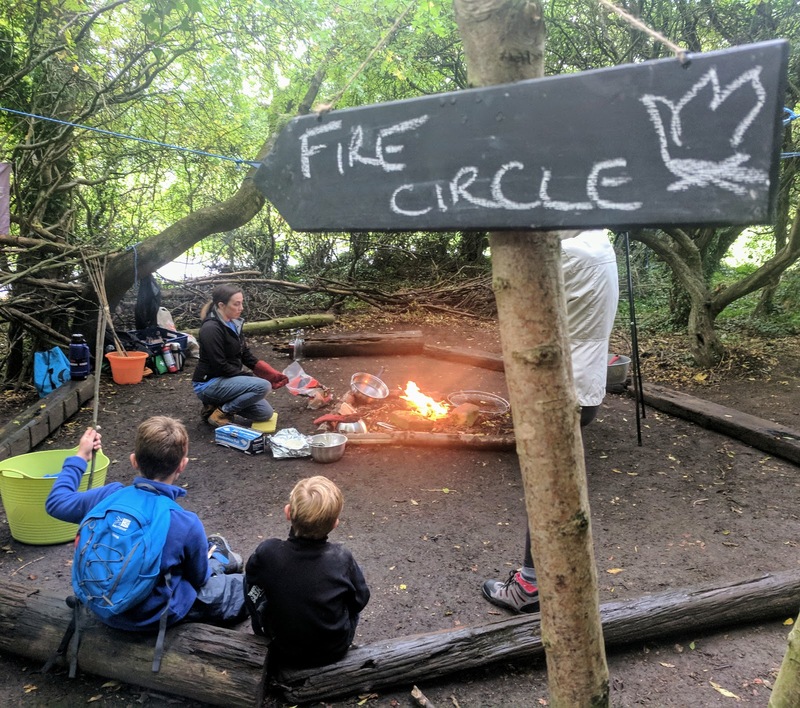 I loved that the kids could just run off and do their own thing - there's no structure or kids being forced to do something they're not keen on - they can all choose which activities they'd like to try first. We split up for most of the afternoon with Harry and Heidi doing their own thing whilst I supervised Jack. Here are some of the activities we got up to. I still can't believe we managed to fit them all into just two hours! The first activity my three wanted to join in with was baking bread. 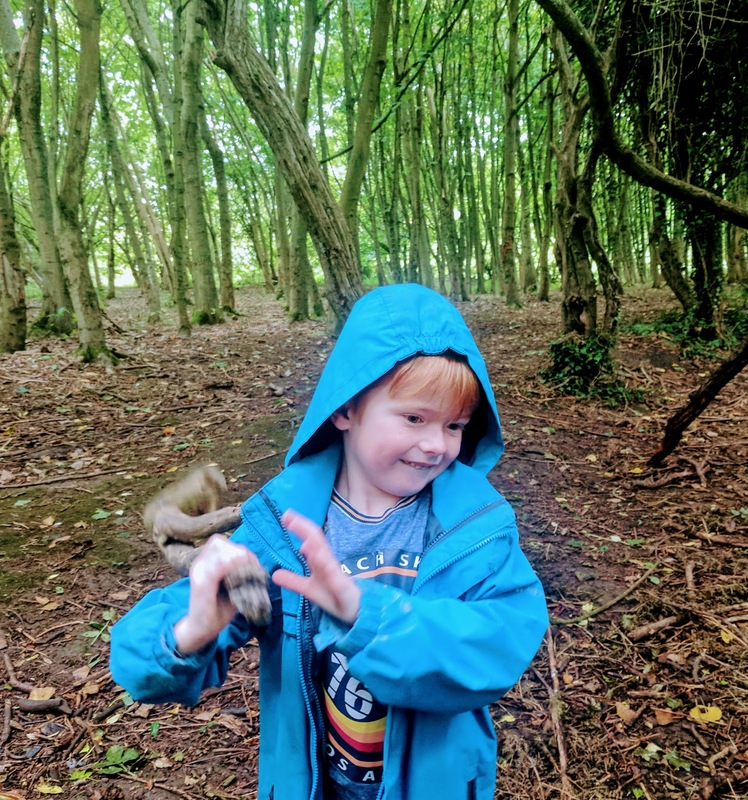 This is something we do fairly regularly at home and really enjoy but I think doing it in a special forest setting made it that little bit more fun. Rachel led but encouraged everyone to get involved. 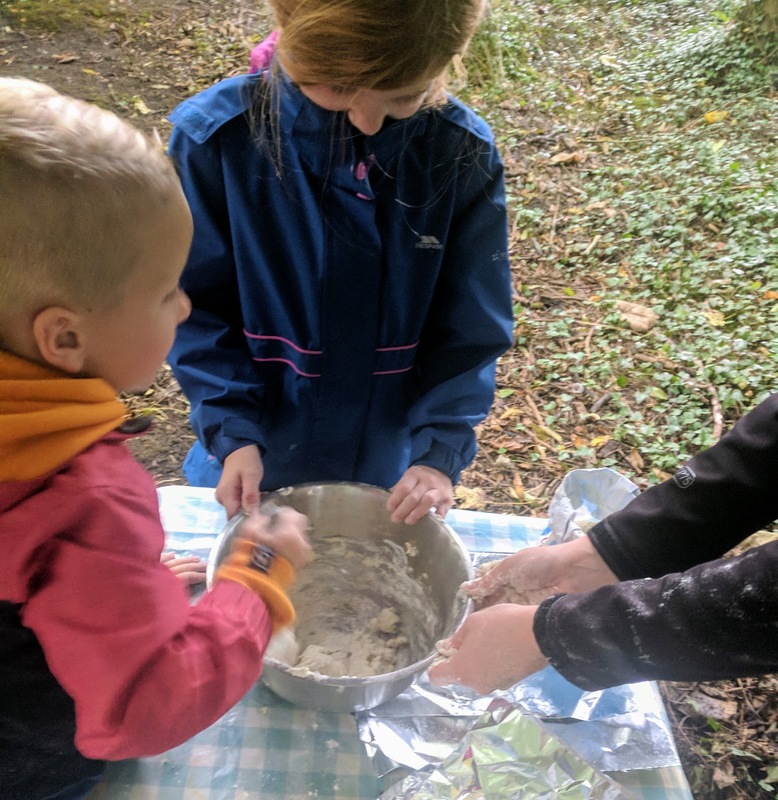 The dough was saved to be cooked on the campfire later in the day. 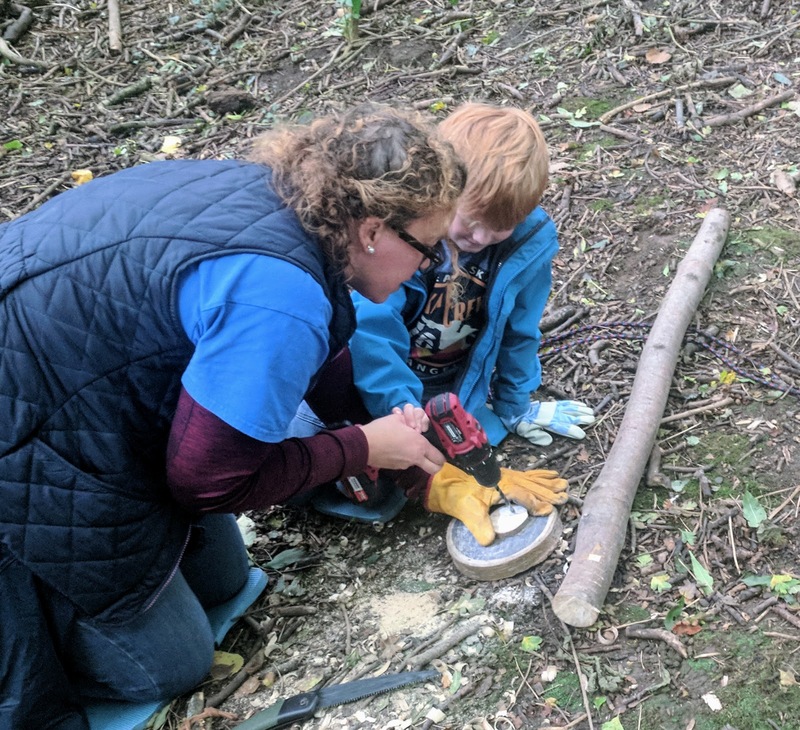 There's no way I'd let them loose on our power tools at home so they loved the chance to have a try in this safe and supervised session. 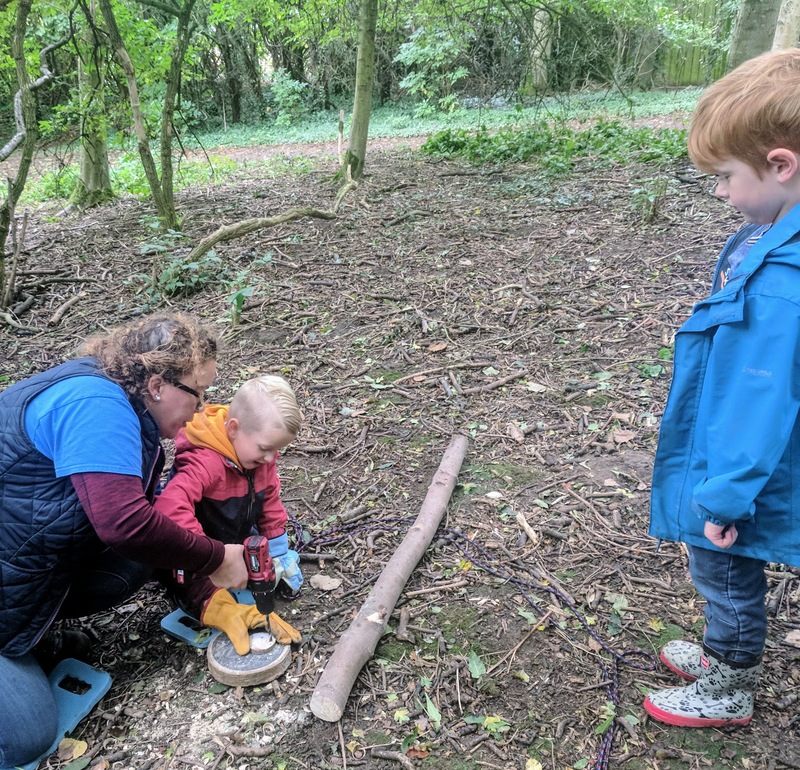 The children took it in turns to use saws, drills and blades and created wooden medallions and sticks for their marshmallows. Jack particularly enjoyed this and was very determined to saw through some wood all by himself and with a little guidance, he managed it. He was super proud and it was great for his self esteem. 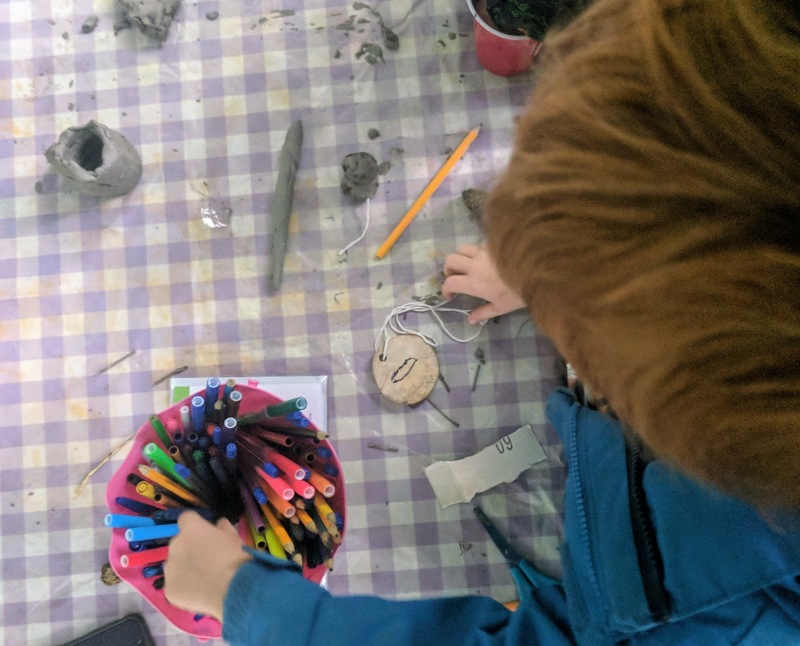 My three love messy play but it's something we don't do as often as they would like so when the opportunity to create forest-inspired models from clay was presented to them, they were super pleased. 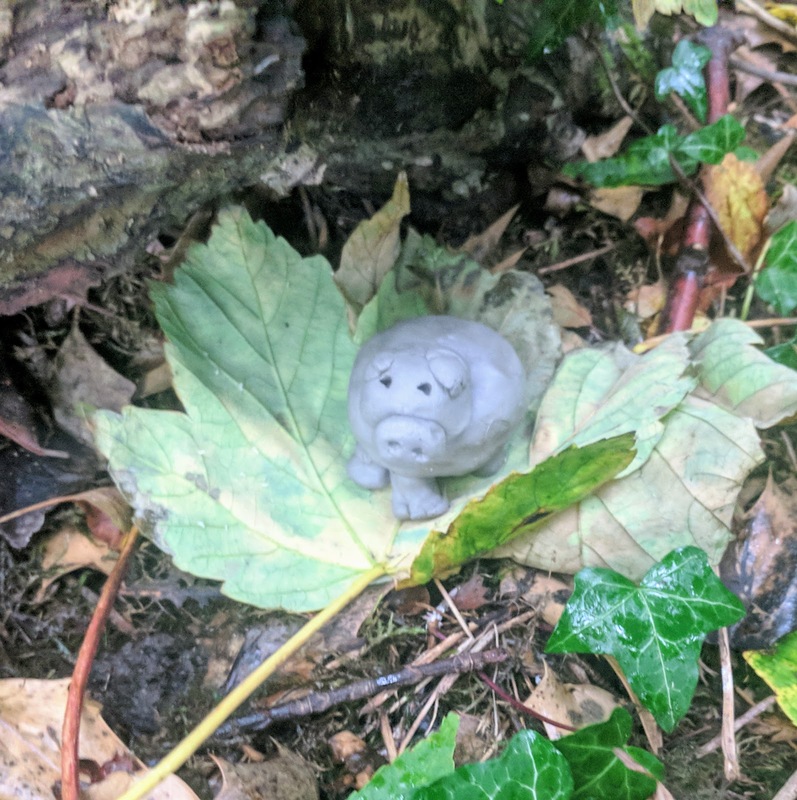 Heidi and Harry mostly did this when I was with Jack in the tool section and they worked super hard to make their own woodland mug and woodland piggy! 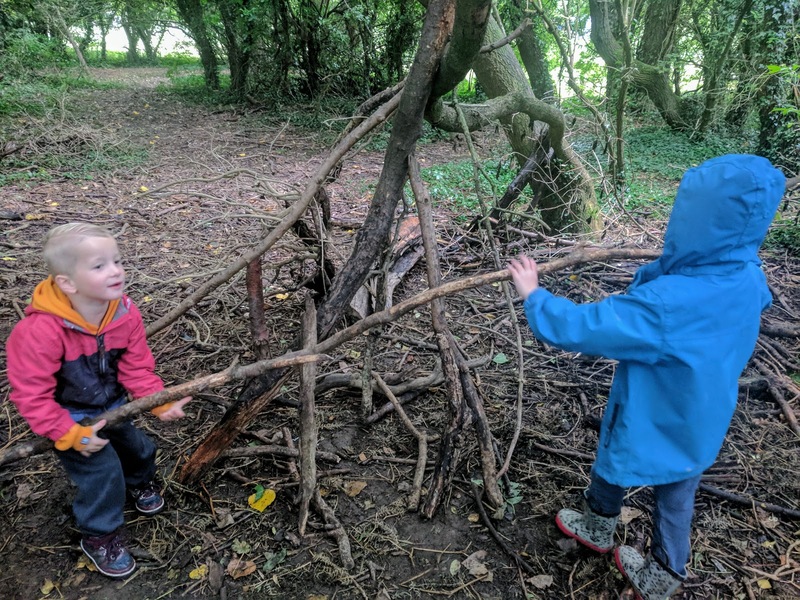 They found a safe den in the forest for them to hide in when they tried the other activities and were able to bring them home at the end of the session which pleased them greatly. 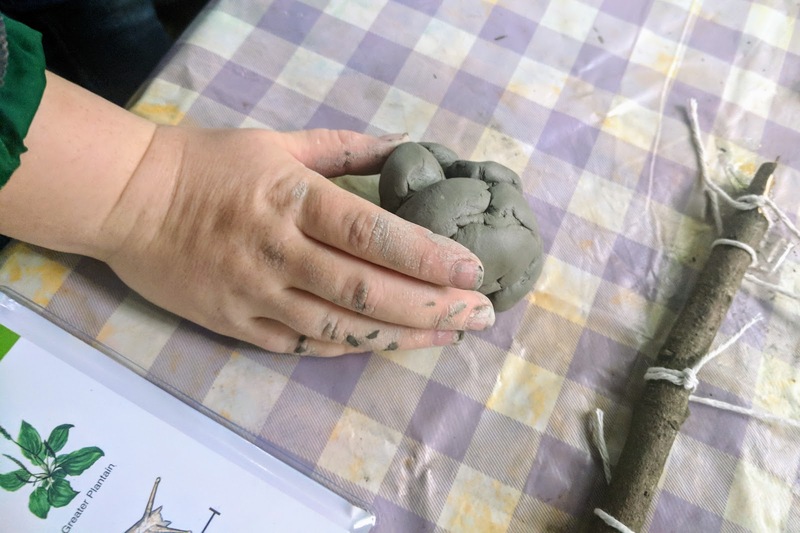 If clay isn't your thing, you could also learn how to make various types of knots and how to use them to create a hammock or string bag and there were rope courses around the forest to try too. This is something the kids were encouraged to run off and do by themselves and this delighted Jack and his friend Charlie. 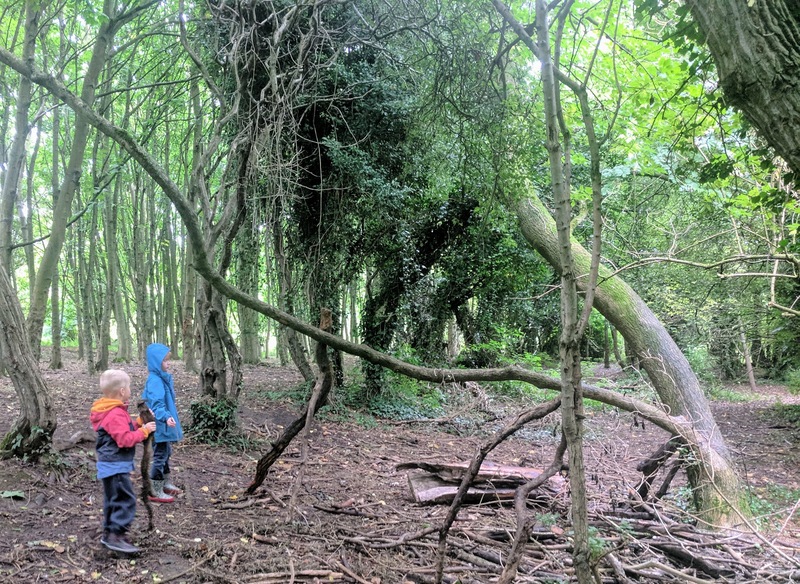 I love the picture of them below as they are clearly really thinking about how they're going to build a good den. I loved that they worked together in a team and they really were proud of their final den (which I forgot to take a photo of - oops!). Our session ended with us all gathering around the campfire. We'd been out in the cold and rain for over an hour and it was the perfect way to end our session. It felt super safe with plenty of adult supervision and checking that the children all knew and followed the rules. The photo below really sums up our afternoon - I can't remember what we were all laughing at now but I do remember the feeling and that we were all feeling nice and happy. 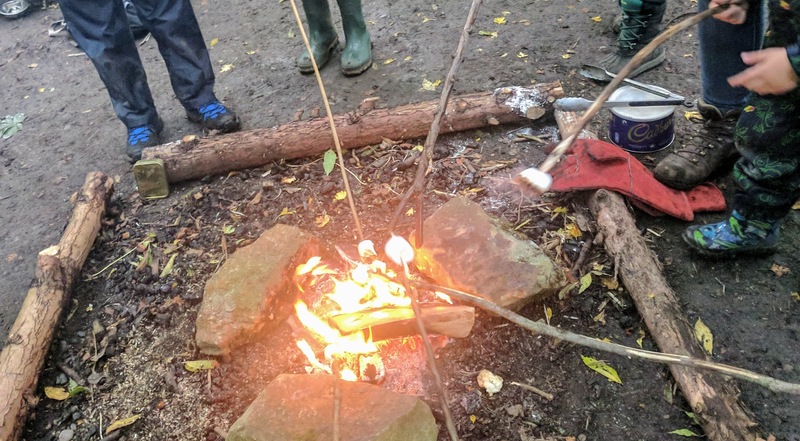 Mugs of warm tomato soup were handed around with chunks of our homemade bread and we ended the day toasting some marshmallows on our special sticks - perfect. 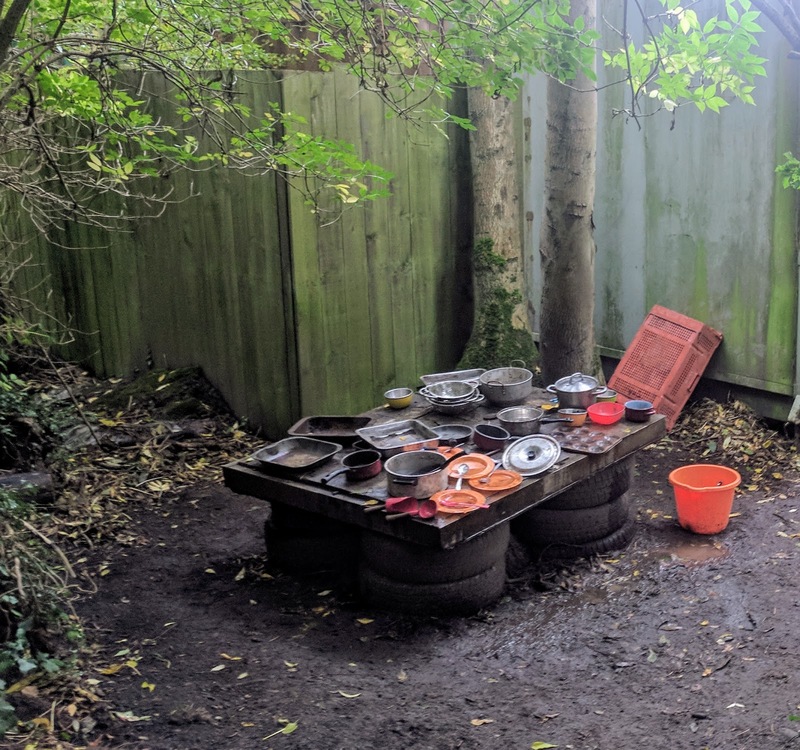 Finally, how cool is this mud kitchen! It was a real hit with the smaller children in our group who spent time creating and getting messy. We packed so much into our 2 hours session, when I checked my watch on leaving I really thought we'd been there for around 4 hours. It never felt rushed and Harry, Heidi and Jack all left tired and muddy but with huge smiles on their faces. 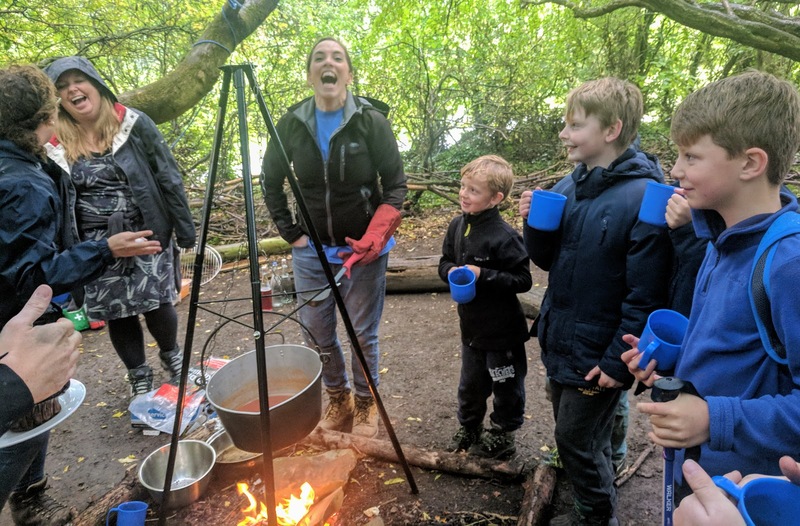 What really makes Forest School special for me is the staff - Annie and her team are all super passionate about the great outdoors and encouraging children to create their own adventures. It's a hard balance to keep children safe yet give them the freedom to explore AND ensure they have lots of fun. Footprints on the Moon manage to get the balance just right. The afternoon was inclusive to all with nobody feeling left out and I really believe it worked wonders for the kids' confidence and self worth. 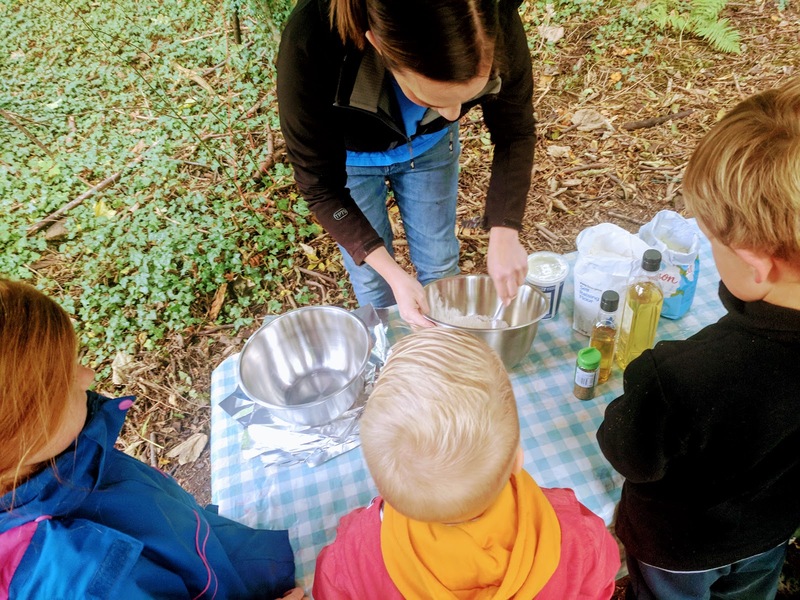 Footprints on the Moon offer birthday parties, private events for groups, schools and team-building, forest school and special TreeTots sessions for under 5s. Check out their website here for details. Oh wow this looks like so much fun! I want to go, love the idea of building a den! 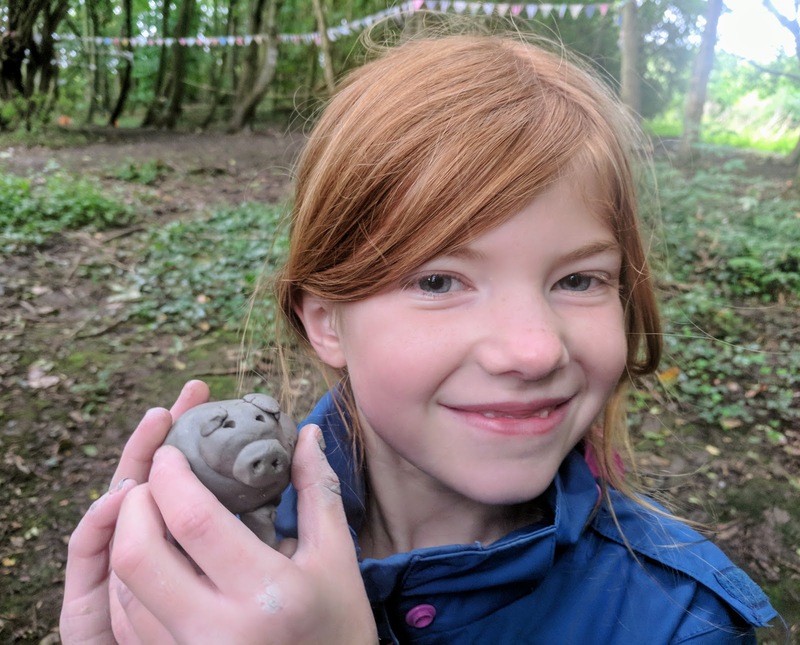 I always love the sound of Forest schools and the activities here sound brilliant - fab clay piggy! So great for boosting kids confidence too.